Donald Trump has climbed down from the tree he climbed up a few days ago when he gathered a large military force and firepower similar to “operation desert storm” (but without ground forces). “Plan A” consisted of a destructive attack on Syria to destroy its army, presidential palace, command and control bases, elite force, strategic military and ammunition warehouses, radar, defence systems and political leadership institutions. Prior to the triple attack on Syria by the US – UK – France, intensive contacts were carried out by Russia and President Vladimir Putin himself – at around 04:00 am– to reduce the attack and go to a softer, less significant “Plan B”. Russia, in its contact with several heads of state, rejected any hit that could cripple the Syrian Army and instructed the leadership in Damascus that the West would now think very carefully before radically changing the balance of power in the Levant. But what is the real reason behind the US – UK – France’s attack? Is it the claim of the “chemical attack” on Duma? The Organisation for the prohibition of the chemical weapons is already in Damascus and its members visited Duma on April 5th to inspect the location where the claimed use of a chemical attack was alleged to have taken place. Why not wait for the results? Sources in Damascus explain that the Syrian Army and its allies, supported by Russia, were carrying out a large attack on rural Idlib and had reached Abu al-Duhur airport when, all of a sudden, the military operation stopped. The entire spearhead force was moved to Ghouta. What happened? Russia had informed the Syrian leadership of a large gathering of forces at Al-Tanf US-occupied military base on the Syrian-Iraqi borders, where tens of thousands of US proxies have received continuous military training. The Russians identified unusual military movements and understood that the US was preparing to push Syrian proxy forces to reach eastern Ghouta, linking itself with around 30,000 jihadists in Ghouta itself. This attack was planned to take place simultaneously with a diversion from Daraa, southern Syria, attacking south of Damascus so as to deceive the Syrian army and its allies into leaving smaller forces around the capital. The US plan – said the sources – consisted in supporting its proxies and the Ghouta jihadists to reach Damascus and take full control of it. But the shifting of the military operation from rural Idlib to Ghouta spoiled the US plan to impose on Russia an enforced stay in Lattakia and Tartous confined to a limited place, and to finally change the Syrian regime. 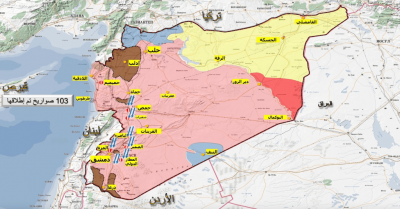 This “genius’s plan” would have spoiled all Russia’s efforts deployed through almost three years of heavy involvement in the war in Syria, and would have given the US the upper hand , just at the moment when Moscow and the Syrian Army were about to end the war, with only few more pockets left to liberate. Russia’s hit in Ghouta broke the US plan into pieces, and imposed the withdrawal of tens of thousands of militants from Ghouta along with their families, to the north of Syria. The capital is now much safer, with the remaining area south of Damascus occupied by Al-Qaeda and the “Islamic State” group (ISIS) in Yarmouk camp and al-Hajar al-Aswad. Today Russia rendered the US – UK – France strike meaningless, both in respect of its content and its objectives. Russia was able to impose that US – UK – France carry out only a “limited attack” of little value, and with not much chance of altering the reality on the ground in Syria. When Russia vowed to shoot down missiles fired at Syria, Trump answered: “Get ready Russia because they will be coming, nice, new and smart”. Russia, after the hit, replied: “We have used the old Soviet anti-Air defence system against these smart, new and very expensive missiles fired by the Americans”. Not only that, the US-UK air strikes hit objectives which Israel bombards almost on a regular basis. By showing the capability to stop two thirds – as declared by Russia – of the incoming missiles, Syria is taking it as a kind of “training with live ammunition against any future Israeli attack on Syrian territory”. Israel is very disappointed and seems not at all pleased with this end result. Showing restrain and control, the US Secretary of Defence James Mattis – he who said “the Pentagon still has no independent evidence to confirm that there was a chemical weapons attack in Syria last week”- contested any wide scale attack on Syria that could have triggered a direct Russian involvement and deadly return of fire against US objectives. Mattis accepted “an honourable strike” to save his boss’s inexperienced face. In point of fact, the trio’s strike on Syria seems have boosted the Syrian Bashar al-Assad’s reputation: the population celebrated in the streets of Damascus, and mocked the western attack on their country! The trio avoided at all times direct provocation of Russia, circumvented Russian bases and operational theatres instead of overflying. Russia imposed its presence and provoked the US and French navy by carrying out a simulated air attack, to show its willingness to hit back. The Russian navy was positioned opposite the Lebanese coast to cover that angle and avoid blind spots. “It was an excellent idea. It drew the Soviets into the Afghan war and we gave them Vietnam”. Putin has avoided the same US trap almost 40 years later. All eyes are directed on the northern city of Idlib controlled by al-Qaeda now that the fate of Damascus is secured. But why Idlib? The situation in Yarmouk camp, south of Damascus, seems directly linked to that of Fua and Kfarya. During the Zabadani negotiation, it was agreed between al-Qaeda and Damascus’s allies to keep away from al-Yarmouk, in exchange for the two besieged cities in the north of Syria. However, Damascus is now pushing to clean the capital completely, attempting to persuade its allies to bypass previous commitments. As far as Daraa and Quneitra in the south are concerned, it seems no one in Syria seems willing to provoke the US and Israel at this tense moment; this will maybe be left to the end. In al-Badiyah, the Syrian steppes, ISIS is totally surrounded and can only wait to be exterminated in the coming months. Idlib remains despite the Turkish-Russian-Iranian economical and financial agreement. There is no doubt about the existence of strong differences of an economic nature between partners over Syria. Turkish President Erdogan expressed his support and later satisfaction with the US strikes on Syria. Russia answered by asking him to deliver the city of Afrin to the Syrian government. Iran’s special envoy for Syrian affairs Ali Akbar Velayati overtly stated that the next objective is Idlib. Therefore, it is now feasible for Turkey to pull out of its dozen observation bases around Idlib, even as Russia pulled out of Afrin prior to the Turkish attack. And Russia expects Erdogan to cancel the previously agreed sale of the S-400 missiles any day. Thus, the compass points to Idlib, Rastan, Jisr al-Shoughour and the Syrian Army forces gathering in rural Lattakia, ready to divide Idlib after liberating the many villages around it. This will bring the world to the next “chemical attack” appointment in the next operational theatre of the Syrian army and its allies. Would the US stand by al-Qaeda? Why not? It has never really been a question of the use of chemical weapons, since the US holds the largest stockpile of chemical weapons worldwide: the real issue is the defeat of the US faced with the dominance of Russia over the Levant.